Prof. dr. Andreja Jaklič, assoc. prof. dr. Anže Burger, and prof. emeritus dr. Marjan Svetličič from Centre of International Relations (CIR) took part in the 44th European International Business Academy (EIBA) conference. 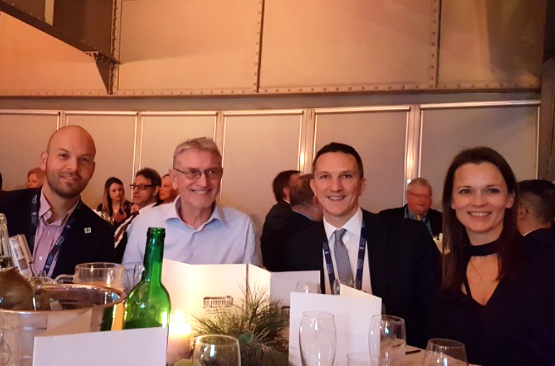 The conference titled ‘International Business in a Transforming World – the Changing Role of States and Firms’ took place in Poznan, Poland, between 13th and 15th December 2018. At the conference, which attracted more than 400 delegates, special attention was paid to the changing economic and political context worldwide and the implications of change for MNEs, SMEs, INVs, and global start-ups. Prof. dr. Andreja Jaklič presented a paper titled ‘Economic diplomacy at foreign market entry; difficult entry modes or difficult markets?’ (co-author: dr. Slobodan Šešum from the Slovenian Ministry of Foreign Affairs), co-chaired a panel on the social effects of international entrepreneurship, discussed the backlash of globalisation – and how IB can respond to- and invest cyclical and structural phenomena at a panel with prof. dr. Erzsébet Czakó from Corvinus University of Budapest, Hungary, prof. dr. Sarianna Lundan from Bremen University, Germany, and prof. dr. Krzysztof Obłój from Kozminski University, Poland. She also participated in a workshop ‘Using Zoom™ and Globesmart™ to Enhance International Business Online Teaching’, and attended a panel on ‘Using ForClass™ to Drive Student Engagement and Accountability in International Business Courses’. At the latter panel, initial findings from surveys conducted for the ‘Open Access Digital Video Case Library for teaching International Business’ project (which CIR is a part of) were presented. Assoc. prof. dr. Anže Burger, who is a national representative for Slovenia on the EIBA board, moreover presented a paper on ‘The impact of acquisitions on growth of European high-tech entrepreneurial firms’ (co-authored by assist. prof. dr. Patricia Kotnik from Faculty of Economics, University of Ljubljana, and assist. prof. dr. Mustafa Erdem Sakinç from Université Paris 13, France), while prof. emeritus dr. Marjan Svetličič participated on a panel titled ‘Back to Eastern Europe: EIBA Recollections and Visions for a Transforming World’ with colleagues from Portugal, UK, Switzerland and Poland (i.e. prof. dr. Vitor Corado Simões, prof. dr. Timothy Devinney, prof. dr. Philippe Gugler, prof. dr. Krzysztof Obłój, and assist. prof. dr. Marlena M. Dzikowska).